You'll wonder why you haven't started lessons already. I was never taught how to sing and play at the same time, but I grew up going to church and learning from the musicians in the church band. The goal there was to get the biggest, most gloriously convincing sound possible (think ‘host of angels’), so of course anyone that played an instrument and had a mouth free was also given a microphone. Playing one thing and singing another, whether melodically or rhythmically different was such a challenge! My only method was to learn the piano piece so well that I didn’t have to spare it a thought allowing me to focus all my attention on trying to sing properly. Eventually it became second nature and from that point on, playing and singing went hand in hand (or voice in hand?). In my adolescence I played piano and sang to myself or my family, in high-school it was in an original girl-group called ‘Wireless Bra’ (! ), throughout university performing with music degree peers, then into adulthood playing solo and in different bands. And do you know what’s crazy? I sang and played for all these years in all these situations and I never once realised how much each skill was informing the other! 1. LEARNING TO PLAY AN INSTRUMENT ALLOWS YOU TO SEE A REAL REPRESENTATION OF YOUR MUSICAL KNOWLEDGE IN FRONT OF YOU. Being a vocalist has its unique challenges and advantages (you can take it anywhere with you without having to lug it about the place, amazing! ), but seeing the notes you play right there in front of you is unfortunately something you miss out on when your instrument is beneath your skin. This is why learning to play an instrument can be so beneficial for vocalists - it gives you something visual to base your growing musical knowledge on. 2. A REFERENCE TO WORK OUT YOUR MELODIC & HARMONIC CHOICES. You may know how to sing a harmony along to a melody. Some people can do that naturally, fantastic! But what if you’re hit with some music that disorientates you? Finding the harmony naturally is not always reliable, but if you can picture a piano in your mind, or better yet, go to a piano, you can count up the keys until you find the harmony that fits. 3. ACCOMPANY YOURSELF IN VOCAL EXERCISES. You can use your piano skills to give a base for the exercises you do. Working upward in pitch chromatically? Being able to play basic chords as a foundation for exercises takes the guess work out of hitting those notes directly. 4. ACCOMPANY YOURSELF SINGING SONGS. Who needs an accompanist when you have your own hands? When you don’t need to rely on anyone else to create music you are unlimited by time, place or circumstance. You can create musical wonder with melody (voice), harmony & rhythm (piano) all on your own, whenever inspiration strikes. As long as you have a keyboard or piano in your home, you can practise whenever you want and even start writing your own songs. Why not? Be self sufficient! 5. BECOME A MORE 'WELL-ROUNDED' MUSICIAN. The advantage of playing an instrument puts you ahead of non-instrument playing peers. It makes you more valuable as a band member when you can take on multiple roles. You’ll be better equipped to write songs and able to collaborate with other musicians and talk about music theory confidently. “You may have read all this and thought “OK, this is a good argument for learning an instrument, but why piano?”. IT’S THE BEST ‘FOUNDATIONAL’ INSTRUMENT TO UNDERSTAND THEORY. = how music works. Players of all manner of instruments are often encouraged to either learn piano first, or alongside their instrument of choice because it provides a simple framework for your musical knowledge. The best thing about the piano is that it’s percussive. You hit a key and you know pretty well what sound is going to come out. There’s no awkward phase (like with the violin or saxophone) where everything sounds awful to begin with while you figure out how to get a proper sound! Piano is delightful from the beginning, no finesse required! Huge for morale! IT’S THE SAME THING REPEATED 8 TIMES. The piano can look daunting but it’s really just the same 12 notes repeated 8 times. Twelve itty-bitty keys are all you have to remember. The piano can simultaneously produce melody, harmony and rhythm. It’s versatility is a big advantage and the main reason why it has been a strong contender for World’s Most Popular Instrument since it was invented in the 1600’s. 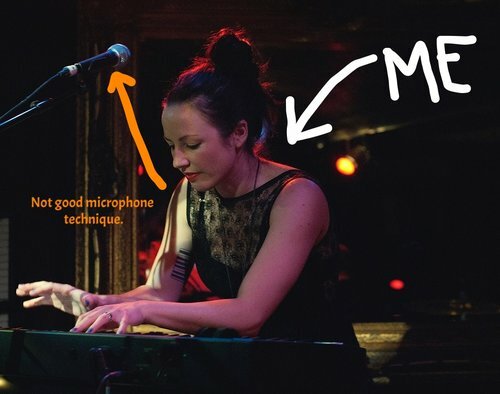 “If you really want to get ahead, learning the piano is a great way to upskill as a musician and make your life as a vocalist that much easier. Just kidding. I hate those things too, but all too often these are the words associated with learning the piano and it’s a real shame. Dull and repetitive lessons have left many would-be pianists unenthused. It’s completely unnecessary! This is why I have designed a piano course that is NONE of those things, but instead has all the good things: fun, entertaining, easy, convenient and affordable. Download your vocal warm-up piano cheatsheet! Using this as a reference, you can easily accompany yourself in warming up your vocal folds without breaking a sweat! Thank you for signing up! You can now instantly download your free Vocal Warm-up Piano Cheatsheet!